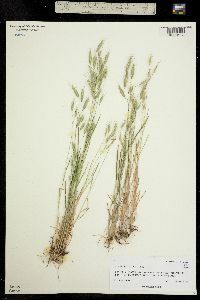 This species is now found throughout the state in habitats similar to those of Bromus commutatus. Much like no. 16 [Bromus commutatus Schrad. 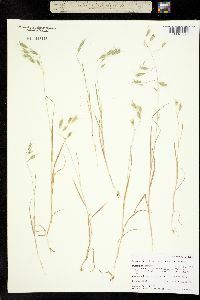 ], and apparently passing into it, but the panicle avg a little larger, and with slender, flexuous, spreading to drooping branches; spikelets (13-) 15-30 mm; lemmas (6-)7.5-9 mm, 1.2-2.2 mm wide in side view; awns 7-12 mm, flexuous or recurved-divergent, the longest ones of a spikelet more than twice as long as that of the lowest lemma; palea 1-2.5 mm shorter than the lemma; 2n=14. Native of the Old World, intr. 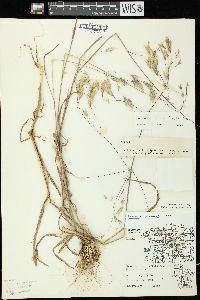 as a weed in waste places from N.H. and Vt. to Ga., w. to the Pacific.